The INFORMS Impact Prize recognises an individual or team whose contributions have had a widespread impact on the practice of operations research. With great pride, the COIN-OR Strategic Leadership Board extends its congratulations to nine of the pioneers of COIN-OR, Brenda Dietrich, JP Fasano, Lou Hafer, John Forrest, Brady Hunsaker, Laszlo Ladanyi, Robin Lougee, Ted Ralphs, and Matthew Saltzman, the recipients of the 2014 INFORMS Impact Prize. In its citation, the Impact Prize Award Committee writes: The Computational Infrastructure for Operations Research (COIN-OR) is an initiative to spur the development of open-source software for the operations research community in order to accelerate the adoption and the evolution of computational operations research. COIN-OR provides development tools, distribution, standards, licensing information, and other infrastructure needed to facilitate and nurture open, community-driven software. The COIN-OR initiative was launched at the 2000 International Symposium on Mathematical Programming as a three-year experiment by IBM Research. In 2004, a dedicated nonprofit corporation was formed to take over the successful and growing initiative. In the fourteen years of its existence, COIN-OR has grown from its initial offerings of four software projects, to more than fifty projects spanning much of computational operations research. 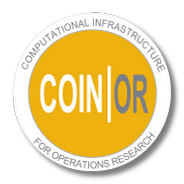 COIN-OR has influenced every aspect of operations research: research, practice, education, community, and outreach. Software supported by COIN-OR has been an essential part of hundreds of peer-reviewed research papers and is embedded in dozens of software systems, including the most widely used environments for performing analytics in practice. People use COIN-OR software every day to implement advanced operations research solutions to important problems. Through its on-line, in-person, and print activities, COIN-OR has been educating the operations research world about OR software and the potential of open source. Thousands of people have been involved with COIN-OR; over 1400 people subscribe to one or more COIN-OR mailing lists today. COIN-OR is the result of the collaboration of many people over many years, but there are key individuals whose significant early contributions and leadership distinguish them. We recognize the individuals who launched COIN-OR at IBM Research, where the initiative was conceived and grew over the first four years to a successful community repository, and the individuals who incorporated the non-profit COIN-OR Foundation, Inc., where the initiative has thrived and continues to grow today. For their pivotal role in the creation and wide-spread adoption of COIN-OR, INFORMS is pleased to award the 2014 Impact Prize to Brenda Dietrich, JP Fasano, John Forrest, Lou Hafer, Brady Hunsaker, Laszlo Ladanyi, Robin Lougee, Ted Ralphs, and Matthew Saltzman. The INFORMS Impact Prize recognises nine individuals. Without diminishing the well-deserved recognition given to the recipients, the Board would also like to extend its congratulations to all the members of the COIN-OR community. The COIN-OR initiative would not have been so successful without all those individuals who have contributed their time, expertise and software to support our endeavors, and all those users who have spurred us on to greater effort with their valuable feedback. The Board takes this opportunity to recognise the accomplishments of our community over the past decade. We look forward to the accomplishments we know will come in the future. The Apache Software Foundation (ASF) has announced availability of OpenOffice version 3.4.0. Among its new features: The linear programming solver in the Calc spreadsheet program has been replaced with COIN-OR tools. The spreadsheet uses the CoinMP API, which in turn uses the COIN-OR Branch and Cut MIP solver (CBC) and the COIN-OR Linear Programming solver (CLP) as solver engines, the Open Solver Interface (OSI), the Cut Generator Library (CGL) and the CoinUtils utility library.